A fabulous feel-good novel from the bestselling author of What Holly’s Husband Did. If you had the chance to go back and relive it all, what would you do differently? Go on that date, take that promotion… not eat that second biscuit? Hattie is about to discover where she went wrong, but will her mystery second chance reveal some STONKING secrets in her past that probably should have stayed hidden? A gorgeous romantic comedy with a few twists that will make you say OMG! Perfect for fans of Tracy Bloom, Marian Keyes and Dawn French. Well I simply loved this refreshing novel. It is a story about a girl and her life. Hattie Green has faced highs and lows in her life, heartache and drama but just plods along like we all do until a strange day in Tesco! 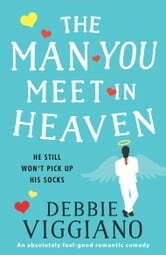 The author has written a very light hearted novel which touches on difficult subjects and horrible life dramas that we face and perhaps wish afterwards we had acted differently. I loved the way the author told Hattie’s story and there were a few surprises in there too! Fast paced book where you really want to find out what happens, but you don’t want it to end. I also discovered a new word – MENTIONITIS – something I certainly suffer from repeatedly – and all my friends would agree. Thank you to Debbie Viggiano for bringing these characters to life and making me laugh so hard when I should have been sleeping and reminding us all to let go of past mistakes, release anger held against others when it does more harm to us than to them! This is the first time I have read a book by this author. I found this story quite unique and original with lots of laugh out loud moments. Very easy reading and nicely ended. I look forward to reading more of Debbie's books.